Steps to the beach from this 1st house on beach access road! Property Size 2,800 sq. ft. Welcome to The Destin Boomerang! 100 STEPS TO BEACH ACCESS!! The Destin Boomerang - as owners since 12/09, we constantly keep this beautiful property up to date, having completed a full, upscale renovation of the main house in May 2012, the cabana house in 2015, and constantly addressing any furniture replacement needs. We have thought of just about everything - just bring your swimsuits and sunscreen. Enjoy such luxuries as the granite/stainless kitchen, flat screen TVs in every bedroom and living area, Wii and X-box360 for the kids in the spectacular built-in bunk room , an extensive video collection as well as games and books for all ages. Enjoy the comfort of premium bedding sets and each floor has its own HVAC unit for comfort throughout. Amenities galore, we want you coming back! 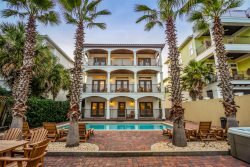 Situated with just one house between you and the sugary white sand beaches that Destin is famous for. The house itself is nearly 2800 sf with another 600 sf spread out over 6 private balconies and porches! You will enjoy the shops and restaurants at the Destin Commons just 4 short blocks away. Living room, Dining area, Kitchen, Full bathroom, Fantastic Bunk room, Laundry room. Enjoy watching a DVD on the 55" flat screen from the comfortable sofa (sleeper). Or just enjoy curling up and reading a good novel in one of the 2 luxurious Henredon arm chairs while the kids and mom or dad are off fighting the waves. The living room flows into the dining area where you will enjoy a fabulous "Chic Teak" dining table for 8 with water hyacinth chairs and 4 matching bar stools along the counter for plenty of seating. The kitchen is a gourmet's dream! Stainless everything and granite counter tops accented with a tumbled marble back splash. Off the kitchen is the kid's spectacular retreat with two sets of bunk beds (queen over queen and full over full) for an availability of 8 to sleep. 2 desk nooks at the end of each bunk for down time. They can also enjoy watching a video or playing with the supplied Wii (just make sure they don't spend all their time indoors on vacation!). 2nd (sleeps 4): Master Bedroom and second king bedroom - each with attached tiled shower bathroom, (jacuzzi tub as well in master). Master features a pillow top king bed. Step through the French doors to your private balcony and enjoy the sounds of distant crashing waves. Or just pop in a DVD and wind down a perfect day. The jetted tub surrounded by tile will further relax you, or enjoy the separate shower if you prefer. The second bedroom is also appointed with a king size bed and attached bathroom. It has a balcony that overlooks the private pool. 3rd (sleeps up to 2): Queen Bedroom "the Seashell room" with private balcony and fabulous gulf view. The 3rd floor living room enjoys another comfortable sleeper/sofa and sports a wet bar with refrigerator. The huge rear balcony, overlooking the pool, has sweeping gulf views and proves to offer a great vantage point to watch seasonal fireworks. Resort quality Breezesta Bar height patio table and 4 chairs on this balcony offers great area to play cards or enjoy the breeze. Between the main house and cabana is the 12x24 pool (3 to 5 ft deep - no diving). We have plenty of resort quality Breezesta lounge chairs, as well as a dining table to seat 6 and other various seating on this nearly 1000 sf paver stone deck area for plenty of entertainment room. Have a family ping-pong tournament or just soak in the sun. There is a gas grill and an outdoor shower to clean up with before going back inside. The cabana house (sleeps 6): Private king bedroom with separate entry. While this room will share a bathroom with the bunk room, it has its' own separate vanity for privacy while getting ready. The cabana also has a bunk room with queen over queen bunks. There is a full bathroom which includes a tiled walk-in shower. All bathrooms are equipped with a hair dryer and luxurious towels! Bed linens and bath towels (please supply your own pack-n-play linens). We also start you with 10 beach towels. Private pool. The private pool can be heated from October 1st - May 1st. *Please note there is an additional fee to heat the pool. They were great to work with. They answered all questions and were very friendly and professional. I hope to rent in the future. This was a first for us in Destin normally we get a condo but had extra family and friends coming so we needed larger accommodations this was met and blew away our expectations. The proximity to the beach and shopping is fabulous. The house was super clean and had extras that you wouldnt think like beach chairs, umbrellas, and seasonings in the cabinet ready to go. Although there is a ton of stairs the layout is great as it gives everyone their own personal spaces especially after a long day at the beach. We cant wait to go back. We loved this property. It was perfect for our vacation. We couldnt have asked for anything else. Everything was perfect. The owner stopped by to get something from his storage room, introduced himself to us and took care of two small issues that we had right away and was very nice to deal with. We had a wonderful vacation with no big issues. The property was perfect for our needs and I was impressed at how clean everything was. Having a pool on the property is the only way to go.We were in it every day we were there. Found everyone to be very helpful and friendly. Great communication. We were a group of 15 and had a delightful time while staying at the Boomerang. The property was lovely . Clean and all the amenities. Beautifully furnished. Nice privacy for each family in our group, but still open enough for all of us to feel close when we wanted. Pool was well maintained and perfect for little ones as well as adults. The beach was right there, less than 5 minute walk and you could see the gulf from the house. All and all a delightful stay with memories we will not forget. Jennifer was so friendly! Communication was excellent and we felt welcomed. Would highly recommend staying at this property!! Quick response! Jon and Jennifer were great to work with!! Awesome beach house! Clean and plenty of room for large families. Jon & Jennifer were great to work with. Very quick to respond any time I had questions. Furniture was very nice. Had a lot of items necessary to take to beach, which most places do not have this much. They had plenty of towels & offered beach towels, Had soap dispensers in all bathrooms full, had all kinds of spices which most vacation rentals do not provide these items as well. So it was very nice touch. Pool Heat - From October 1st - May 1st, the private pool/spa can be heated to mid 80's for an additional $275/week (plus tax). Pool heat must be purchased for the entire stay.